Egyptian art shows an apparent uniformity, which makes us to refer to a unique Egyptian style. However, if we pay attention to other cultures of antiquity this perception is different. Greek art, for example, goes through different stages in its history, each with its own style in the plastic manifestations. Thus we speak of: the archaic style, dominated by the hieratic and the geometric forms, of the classic and the Hellenic, these with a progressive realism in their representations. Romanesque church versus Gothic church. Also European sacred art went through different styles. The Romanesque from X to the XII century,showed low, rough and solid-looking buildings. The Gothic style, from XII century until Renaissance. Here buildings had a more stylized and tall aspect with a more elaborated ornamentation. Uniformity of Egyptian Art through the centuries. At first glance these aesthetic changes do not occur in Egypt. When observing a work from the Old Kingdom and another from the New Kingdom, it is easy to identify both as pieces of Egyptian art, even though centuries have passed between them. That is why in European art, there have been trends of “Egyptian style”, that followed Egyptian aspect. 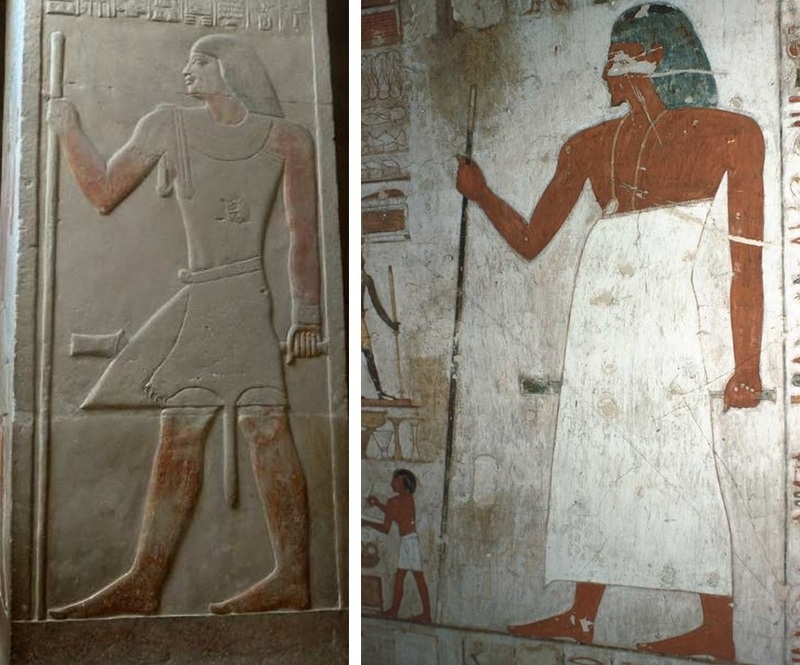 Because it is considered that there is only one art of ancient Egypt, despite the fact that a certain evolution throughout its history did exist. Noblemen from Old and New Kingdom. Uniformity in Egyptian Art is evident. This apparent uniformity is granted by three qualities that characterize the Egyptian art: unity, continuity and monotony. This is especially surprising if we consider that, when referring to Egyptian art, we are facing an artistic production that covers more than 3,000 years of history. There is a factor of cohesion in the Egyptian art that is reflected in the art of the Old Kingdom, in that of the Ptolemaic era, and in the periods of foreign mandates. It is true that time did not pass in vain and that some differences can be observed between works of Egyptian art from one period to another. But the decorative motifs used throughout Egyptian history vary very little: the arrangement of these in space, the gestures, postures and attitudes of the characters, the compositions, the theme …. There are few substantial changes and the essence of Egyptian art remains almost invariable.